Once every century, God chooses a Hero. The child is meant to perform a service in His name, and is identified by a jewel known as the Godstone in the child’s navel, not present at birth, but granted shortly afterwards. Elisa is this child, given the Godstone on her naming day, and now, sixteen years old, she is to be married to the king of the neighboring country as part of a political alliance. Elisa is a scholar, but no warrior. She is very heavy and addicted to food, and while she loves her God and Godstone, she feels there might have been a mistake when it comes to her being chosen. The plot is so much more than I described above. The book is so much more. Elisa is a fantastic character. She’s not well-versed in politics or court life, as the second daughter of a king. She detests her body but won’t make changes to it, and she’s embarrassed by the attention it causes her to receive. She has never met the man who will become her husband, and prays that he will be old, ugly, and fat, so that she doesn’t have to feel bad about her own body on his behalf. Beyond that, there is a constant threat of war against another country who seem to have harnessed the power of some sort of sorcery, something that is considered distinctly heretical in Elisa’s and her husband’s countries. Elisa’s husband, Alejandro, is nice enough. The opening scene, at their wedding, was enough to catch my interest. He is kind, generous, and friendly. He respects her fear of intimacy and never tries to push himself on her, but also exhibits no disgust about her body. His first wife died, and he has a six-year-old son, but he doesn’t compare her to a previous life or expect her to do anything more than hopefully become his friend. Later, it’s revealed he has a mistress, but by the end, you know that he loves that mistress, and that he thinks he would have loved Elisa as well, if they’d ever been given the chance to find out. He wasn’t perfect, but he wasn’t a bad person either, and I loved that. Elisa herself goes on a major journey throughout the book, first joining a new culture, then being kidnapped, then forming a rebel army to fight against the Invernios who are attacking the borders of her new country. She becomes stronger, losing some weight – though she doesn’t become tiny, skinny, or fit, just smaller – and learning to do things that she shied away from in the past. She makes hard decisions, and loses some people she cares about. By the time she is returned to her husband, she’s unrecognizable to him, though his son, Rosario, who only met her once, knows her immediately. I’m doing a terrible job reviewing this book. I really, really liked it. This is set in a fantasy world with Spanish-flavor culture. Religion is a huge portion of their society, and there are all sort of rituals and manuscripts and monasteries. 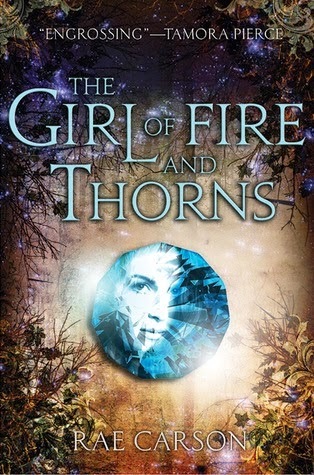 I learned so much more about what I needed to do for my own fantasy series from reading this book. I loved the world-building, and I think that over the next couple books, I might learn more about the Invernios, and maybe understand this war from their point of view. I hope so, at least! Can’t wait to read the others! This entry was posted in 2014, Prose, Young Adult and tagged body image, divinity, favorite, memorable, POC, speculative. Bookmark the permalink.